30 Second Wine Advisor: Aromatic whites: Scent plus! Doesn't Mom Deserve a Taste of the Good Life? Give her a taste of California's wine country with a gift membership from The California Wine Club. Give Mom a 3-month gift membership and she'll get a fourth month on the house. Save $51.95! Aromatic whites? What's that all about? Don't all wines have aromas? Well, yeah! But some wines - a random array of whites in particular - take "aromatic" up to the top. Or, in my opinion, sometimes over the top, but that's another story for another day. Sniff a good Chardonnay, and you'll likely get a fresh scent of green apples, perhaps kicked up with notes of citrus, figs, pineapple. Maybe with butter or vanilla added if the wine maker likes his oak. Those are good smells, yes. But in the realm of aromatics, Chardonnay ranks on the “non-aromatic” side of the ledger. If you want it in an aromatic style, you need to look at oak and malolactic fermentation and other winery tricks. Depending on the variety and its vinification, the aromatics may whomp you upside the head with emphatic whacks of fruit - peaches, grapefruit, musky melon, lichees, mangoes - or gardens of heady floral aromas from roses to gardenias to orange blossoms. Fresh-mown grass, dew-damp hay, pine needles, boxwood ... Honey and almonds, chestnuts ... And on it goes. They call these wines “aromatic” with good reason. You're welcome to join the wine enthustiasts in our WineLovers Discussion Group as we feature "Aromatic Whites" in our monthly Wine Focus feature for May. The subject is wide open, and the definition is up to you. Viognier and Muscat clearly make the cut as aromatics, and I think Gewurztraminer and its kin clearly qualify. Torrontes, Scheurebe, if it's "aromatic" to you, name it and bring it! The discussion topic begins here. Give her a taste of California's wine country with a gift membership from The California Wine Club. They offer more than just great wine - they are a secret supplier of the hard-to-find labels that friends will envy and guests will love. Reds only, whites only, or a bottle of each, they customize each shipment to your liking and guarantee satisfaction. Special Mother's Day offer: Give Mom a 3-month gift membership and she'll get a fourth month on the house. Save $51.95! If you give additional months, you'll save even more. See gift rates here. You can be assured that each bottle they select comes from a dedicated, passionate, small family winery. The small wineries they feature craft some of the finest, award-winning vintages she'll ever taste--some of which are in such limited supply that they never make it outside their winery walls! They scour the state for exactly such finds, compare and taste each one, and bring only the best to members. And doesn't Mom deserve the very best? For today's tasting report I sampled a fun aromatic white from Southern Italy's Basilicata region, way down on the sole of the Italian boot. Kin to the Greco di Tufo of the Naples region, Greco gets its name from the tradition that its ancestors were brought over by the ancient Greeks more than 2,000 years ago. 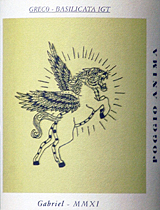 This offbeat label, Poggio Anima “Gabriel,” is one of six made for-the-U.S Italian wines made in a joint venture between wine maker Riccardo Campinoti of Le Ragnaie in Montalcino and U.S. importer Vine Street Imports. “Looking for balance in all things (including wine) is a vital quest for many. The Eastern ideaolgy of Yin Yang is the core of this ‘balance’ in the Poggio Anima concept,” according to the producer’s website. “Fusing this Eastern belief with Western philosophy is apparent when you look at the contradiction of red and white (wines), good vs evil (demons vs angels) and modern ideas with old world winemaking practices (catchy, fun packaging with classic old world wine). Accordingly, each Poggio Anima is named after a familiar angel or demon of ancient scriptures. "Asmodeus," is a Sicilian Nero d'Avola; "Belial," a Tuscan Sangiovese; "Lilith," a Basilicata Primitivo; "Samael," a Montepulciano d'Abruzzo, and "Uriel," a Sicilian Grillo. Today’s wine, Poggio Anima 2011 Basilicata Greco, is named “Gabriel” after an archangel important in Jewish, Christian and Muslim tradition. Ripe and open scents of pears, figs and citrus qualify it as aromatic. Good, crisp acidity gives structure to its rich texture and yields a balanced, food friendly aromatic white that's a very good value in the middle teens. Poggio Anima = "POHJ-joe Ah-nee-mah"